New hobby time, ive recently starting spinning! A craft that is new to me. Its something i stumbled across a few years back when looking up crochet and yarn online an have been wanting to try ever since. I took the plunge when i bought my mum a spindle for her birthday, (and one for myself too) our main plan was to try and see if we could not only make our own crochet projects but the yarn too!. This begun about 5 months ago, and ive learnt quite alot since then so this post will consit of advice that i think is too usefull to miss out on for first time spinners. Now im no means an expert in spinning this post is only to help others an a bit of a list to help me in future. First thing i found was that spinning is so much easier than i thought. Heres some pointers. Along with a little video of me spinning. 1.Always draft your fibre once uve halfed or divided your fibre an pulled it down into strips (see pictures) its time to pre draft before you spin, pre drafting opens the fiber up so that the spin u make on the spindle can travel up into it. 2 Spinning yarn is good fun once you’ve drafted your fibre you attach a leader yarn to you spindle (i usually do this with a loop around the bottom of my spindle). i then spin like i am clicking my fingers this makes the spindle spin, and makes the spin travel up the leader yarn once i have enough spin in m leader yarn i hold my pre drafted fiber in my other hand. Then i click my fingers again make my spindle go again and begin to add the fiber overlaping some of the leader yarn. BUT keeping my left hand pinched on so much of the fiber so i am controlling how much spin it traveling into each part of my fiber. 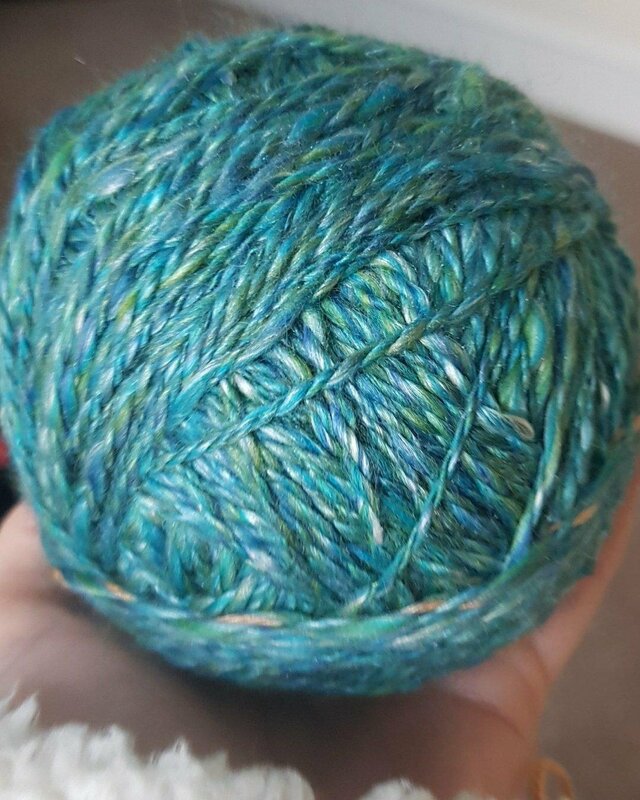 3 Dont make the spun yarn too loose on your spindle. 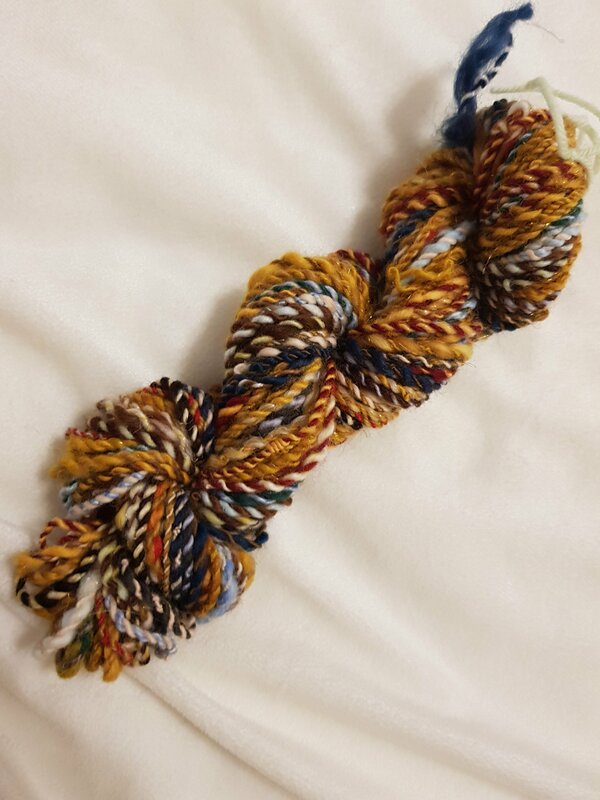 When youve spun some fiber and the twist has traveled up that and made yarn unhook it from the top of your spindle and wrap it around the base of your drop spindle or cop keep tension but not too tight. Only wrap yarn around the cop which has already been spun pre drafted yarn will just break it u dont have enough twist in there. 4 Once your spun all the fiber you want youl have to wind it off your spindle in order to ply it together with other yarn youve already spun or to make your spindle free to spin more yarn. My easy way to roll the spun yarn off the spindle. use a kitchen roll tube! Keep your tension when you wing your spun fiber of your spindle, your winding it off to be plyed with another yarn so you need to keep the twist in it and it also helps it to stop becoming tangled. Hope this post helps newbie spinners!